Hi pals! I'm trying something new with my blog, a weekly feature where I highlight a pet who is available for adoption from Wayside Waifs. I hope this keeps Mom from getting lazy with helping me with my blog! My first weekly feature is a handsome mancat named Jimmy 2 Toes. He's Mom's new "shelter love" so we need to find him a forever home before she starts getting any thoughts about bringing him here to live with us. He is 1 & 1/2 years old. 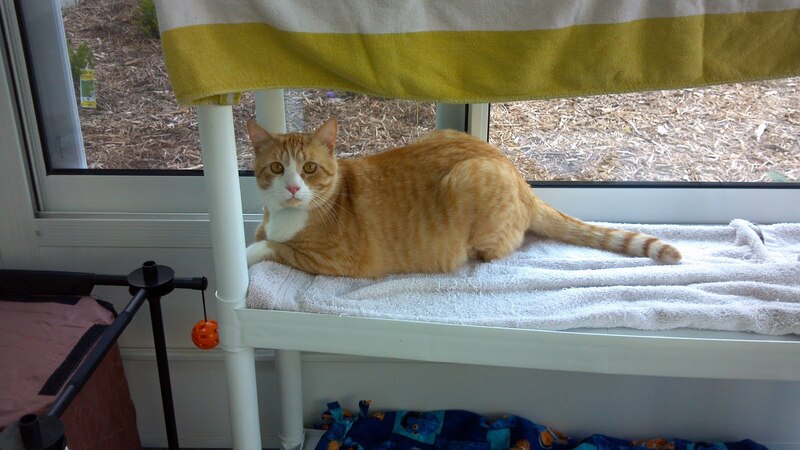 He has been at Wayside before, but was returned after his family discovered the children were allergic to cats. He gets along with other cats. His adoption fee is $50. Jimmy got his name because he only has two toes on his back left foot as the result of some kind of accident. It doesn't seem to cause him any pain though and he gets around just fine. He does seem to be bothered a little by his recent declawing, though. (He was declawed by his adopters.) He sits up on his haunches quite often and this could be his way of taking the pressure off his front feet. 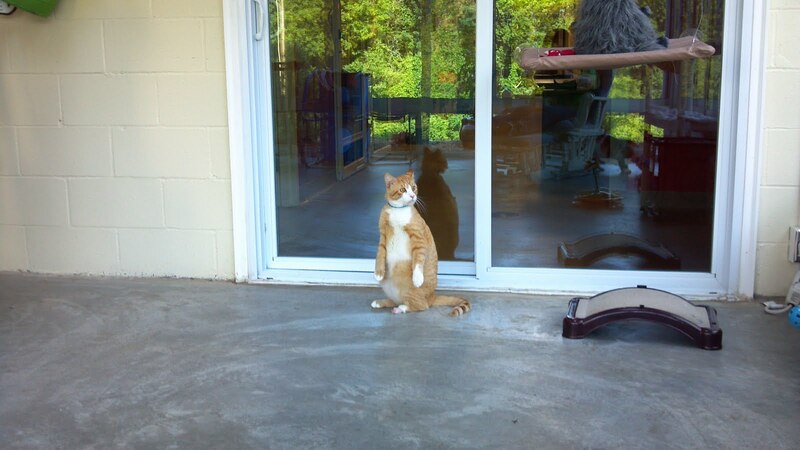 The volunteers call it his "prairie dog imitation" and it is kinda cute looking! 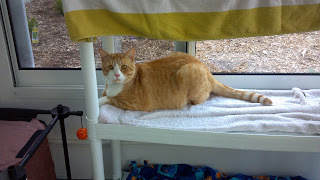 Please spread the word that Jimmy 2 Toes is looking for his forever home, he deserves a loving family. Video used with permission of LLRichman. UPDATE: JIMMY 2 TOES WAS ADOPTED ON SATURDAY, JULY 2ND!! 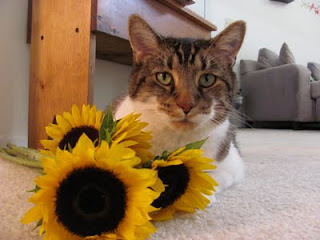 Today is the one year anniversary of Mom's kitty Rosie making his journey to the Rainbow Bridge. He has been on her mind a lot and she thinks that he has been visiting her. Recently, he appeared to her in a dream. Unfortunately, he was old and ill, near the end of his life. Mom would have preferred that he appear young and healthy again, but it wasn't to be. The one thing that she found comforting is the fact that he looked her right in the eye and they had that moment of connection. Another time Mom thinks Rosie was around was a couple of months ago in the bedroom. Mom keeps three boxes of ashes on a shelf in there: one box is Rosie, the other two were her dogs. Each box has the pet's collar on top of it. Twice, the first instance within a week of the second, Rosie's collar was on the bed. The first time, Mom walked into the bedroom and saw the collar on the bed. There was no way for it to fall there, as the bed is not under the shelf, but a couple of feet to the side of it. The next time was a bit spookier. Mom was standing by the bed with her back to the shelf. She was wrapping her hair up in a towel and heard a jingle. Since the towel was over her ears, the sound was muffled. She looked down and there was the collar on the bed once again. Mom has no way of explaining these occurrences. It is even more baffling that the only collar that has moved from the shelf to the bed is Rosie's, not either of the dog collars. She figures it is his way of saying he is still around. Mom misses Rosie a lot. He was with her for 17 years and it was very hard for her to move away and leave him with Grandma and Grandpa. She always felt like she abandoned him because she couldn't explain to him why she had to move. Even after a year, she still looks for him when she visits Grandma and Grandpa. He was a very different cat than I am. Mom said he was street smart and that he understood English (more than just his name and words like "treat" and "outside", he was fluent). She said he was independent and did everything on his own terms. He was a tough guy. Now he's a kitty angel, letting Mom know, on his terms, that he's always with her. There's a new book from Happy Tails Books all about pet blogs. 15 Great Pet Blogs highlights 15 pet blogs, including mine! The others are: Bocci's Beefs, Catlady Land, Champion of My Heart, Dogspired, FIDO Friendly, Grouchy Puppy, Life with Dogs, Petfinder, Speaking for Spot, The Pet Health Care Gazette, This One Wild Life, Thoughts for Paws, Two Little Cavaliers and Woof Report. If you would like to read about pet blogs and see favorite posts from each one, you need to order this book! It is 6"x9", 128 pages and costs $12.95. Of course, like all books from Happy Tails Books, 25% of the purchase price is donated to the rescue of the buyer's choice! Even better, if you order 15 Great Pet Blogs by the end of June, you can save $2.00 by using the code blogbuddy2. Now what about the giveaway? 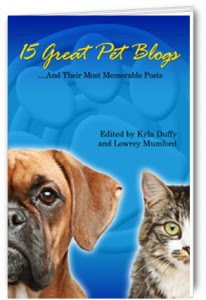 I'll be giving away one eBook copy of 15 Great Pet Blogs. If you'd like to enter, just leave a comment on this post and be sure to include your email address so I can notify you if you're the lucky winner! I'll choose the winner at random on July 3rd. I hope this is just the beginning for giveaways here, so be sure to check back and see what I might be doing! Holy cat! I just won a ginormous 34 pound bag of cat litter from World's Best Cat Litter! I've been using it for a few months now and both Mom and I love it. They recently had a contest on their Facebook page called "Cats Across the Country." I sent in a picture of myself looking as handsome as possible and I was chosen as the winner for the state of Kansas! My prize, along with the bag of litter was a stainless steel litter scoop and a reusable tote bag. Since I'm feeling lucky, I just entered another contest. World's Best Cat Litter has a cross-promotion with The Sensible Feline for another giveaway. The winner gets a prize pack with MORE litter, food, natural cleaners and lots of other stuff. Just click on the link to sign up! NOTE: I wrote this blog out of sheer excitement for winning the contest. I was not paid or otherwise rewarded to write this post by either company mentioned above. I really just love World's Best Cat Litter! There is a dog at Wayside Waifs who has created quite a stir. Her name is Lily and she's bald, er, hairless. When she was brought in, they said that she was a Kerry Blue Terrier and that she had come from a Kerry Blue Terrier breeder. Mom took one look at her and said "No way! That's a Mexican Hairless Dog! ", or a Xoloitzcuintle, Xolo (prononounced sho-lo) for short. Mom wasn't the only one who thought the breed information was wrong. Lots of staff and volunteers were debating this. Mom couldn't find any information on hairless Kerry Blues and her research on Xolos showed dogs that looked just like Lily. Finally, a volunteer decided the only way to settle the discussion was to have a DNA test performed, so she covered the costs and the test was done. PUREBRED, 100% KERRY BLUE TERRIER! Not only were Lily's parents Kerry Blue Terrier, but so were her grandparents and great-grandparents! Mom was stunned! 1. Nostalgia-- I look like an adorable Jim Henson creature, like one of the goblins from Labyrinth. Don't I remind you of your childhood? 2. Pragmatism-- who wants to clean up dog hair off the furniture? Adopt me, and you won't have to! 3. Frugality-- you won't have to get me groomed, and I don't need any fancy shampoos or brushes. 4. Tan lines-- I have them! Have you ever seen a dog with tan lines before? I didn't think so. 5. Fashion sense-- not all dogs like to be dressed up, but me, I'm a total clothes hound. We can even wear matching outfits if you want to. Won't that be fun? 6. Snuggling-- pet me and you'll see how warm I feel. Can't you just imagine cuddling me on a cold winter day? My skin is soft and smooth, too. 7. Distinction-- walk with me, and you'll be sure to stand out in a crowd! Everyone will want to know more about me. Imagine all the friends you'll make! 8. Trolling-- you can tell people you've captured the elusive chupacabra, and I'll totally play along. Heck, even if I did spill the beans and admit I'm a pure-bred Kerry Blue Terrier, no one would believe me. 9. Hipness-- having hair is so mainstream! Furry dogs? Yawn! Everybody has one of those. 10. Friendship-- sure, my unique appearance is incredibly awesome, but the best thing about me is my personality. I want to be everyone's best friend! Take me home, and you'll find out just how much love I have to give. So, if you're in the market for a dog and want something unique, Lily is the girl for you! She comes with a pretty cool story, if you ask me! This is the third and final post in a series about Valentino, Mom's favorite kitty at the shelter. You can read part one here and part two here. On Friday, Mom made brownies for Dr. Pickett and Danny to thank them for their kindness. She took them to the shelter that afternoon. After dropping off the brownies at the vet clinic, she headed back to memorial services with a couple other volunteers. When she got there, Danny wasn’t there and Valentino’s ashes weren’t ready to be picked up. However, since she was there, she decided to ask for a tour of the facility. She was impressed at the services they provide and their level of professionalism. Just as she stepped out of the chapel room, Ryker’s mom walked in. They spent some time chatting and trying not to cry-not just about Valentino, but about other pets of theirs that had gone over the Rainbow Bridge as well. The circumstances brought up a lot of memories for both of them. Our moms talked about what to do with Valentino’s ashes. Mom had wanted him cremated by himself because she couldn’t bear to think about his ashes being buried with a bunch of other ashes. She suggested scattering his ashes somewhere. Ryker’s mom felt like Valentino’s ashes should go home with Mom if that was what she wanted. Mom didn’t want Ryker’s mom left out though and felt bad taking them herself. Since she had to wait until Monday to even pick them up, she knew she had time to think about the situation. Monday morning, Mom drove over to the shelter. She picked up Valentino’s remains and went straight home. When she got home, she opened the box and found an envelope that said “Valentino Palmer.” She was stunned. She never expected them to give Valentino her last name. The certificate in the envelope also mentioned Valentino being part of the Palmer family. She thought his name should be Valentino Volunteer since so many volunteers and staff loved him. But there it was, in black and white. She felt like it was a sign that she should keep his ashes like Ryker’s mom had said. Mom has decided to keep Valentino’s ashes in the office where she helps me blog and tweet. She plans on getting a special shelf to sit them on so he can be a constant source of inspiration to us. With Valentino so close by, we will be reminded of why we do the work we do for homeless pets. We want them all to have families of their own, somebody to wait for at the Rainbow Bridge. This is the second post in a series about Valentino, Mom's favorite kitty at the shelter where she volunteers and his journey to the Rainbow Bridge. The first part is here. When the time came on Thursday, Mom went to the shelter and went directly to Valentino's kennel. She spent about 20 minutes with him, cuddling and kissing him, telling him what a good kitty he was. She explained the Rainbow Bridge to him and told him that Ryker would be there to greet him, along with many other animals. She said he could run in fields of catnip, eat an endless supply of tuna and that he would never be sick again. Mom told him that since he didn't have a family of his own to wait for at the Rainbow Bridge, that he could wait for her and she would be his family. She said they would be together again when the time came. After a few treats and lots of petting, Mom went to tell Dr. Pickett that she was there. She went back to Valentino and the vet came in shortly after to give him a sedative to relax him, then left the two of them alone again. He rested on his bed and was soon snoring away, Mom still petting him and talking to him, giving him kisses on his cheek. After a few more minutes, Dr. Pickett came back with another vet. They brought Valentino out of his kennel to give him the final injection. Before Dr. Pickett started, Mom bent down close to Valentino's ear when the vet told her "He can still hear you. You can keep talking to him." Mom couldn't hold back the tears as she stroked Valentino and told him what a good kitty he was. She continued to talk to him about the wonderful things at the Rainbow Bridge until he left this world and his earthly body behind. Dr. Pickett moved him back to his kennel on his soft bed and covered him up. Mom spoke with him about what would happen with Valentino's body. Among several options, Dr. Pickett told her that he could be cremated by himself and she could get the ashes. Mom liked this option, but had to consider Ryker and Allie's mom's wishes as well as the financial side of it. They agreed to speak the next day about her decision, then Dr. Pickett told her she could have as much time with Valentino as she wanted. She only stayed with him for a few minutes, feeling relieved that it was over and Valentino would never be sick again. She wanted to speak with the adoption counselor, Sharon, who is so loving and caring (she took great care of me while I was there!). Sharon immediately called the memorial services section of the shelter and worked it out with Danny to have Valentino cremated by himself at no cost! Mom was very touched that they would do that. She gave Sharon a big hug and told her that she would check back the next day. On her way home, she stopped and bought a white candle and some white spider mums. Once home, she lit the candle, laid the flowers beside it and placed a magnet with Valentino’s likeness with them. We had a little memorial service for Valentino, thinking about how he was surely enjoying his new life at the Rainbow Bridge. It wasn’t much, but we knew we needed to honor the memory of this kitty who never had a home. Tomorrow I will post the last part of this series about Valentino. Many of you were aware of the sad news I shared on Twitter last week. 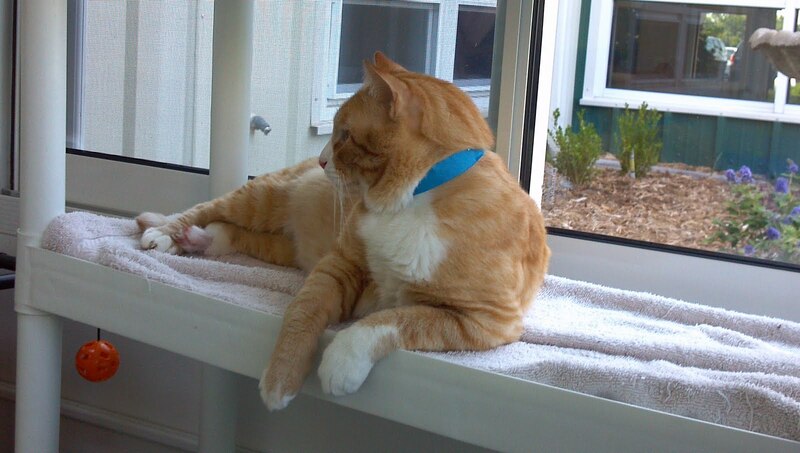 Valentino, Mom's favorite kitty where she volunteers-her shelter love-was quite sick and had to be euthanized. We had such an outpouring of thoughts and pawprayers that I thought I would fill everyone in on the details. This will be the first post in a series about Valentino. Mom visits the shelter every Wednesday. Last Wednesday she knew that Valentino was not on the adoption floor as he had been moved to a back area the week prior for what was believed to be a case of ringworm. Valentino had been dealing with some fur loss so they decided to quarantine him while he was being treated for the sake of the health of the other cats in the adoption area. She was saving him for last to go and visit so she wouldn't cross-contaminate the healthy kitties. Before she could visit him, though, she was paged over the intercom to go to the lobby. When she got there, the vet (Dr. Pickett, who I've mentioned before) was waiting for her. He verified that she was close to Valentino and took her back to see him. When they got to Valentino's kennel, Dr, Pickett explained that Valentino was a very sick kitty. Mom was aware of his recurring upper respiratory infections, his bouts of lethargy and the fact that he had a herpes virus. Dr. Pickett went on to explain that he felt Valentino had feline leukemia, but that it was in his bone marrow and not showing up in the two blood tests they performed. Because Valentino had been picked up as a stray in an area known for a high number of cases of feline leukemia, Dr. Pickett was certain this was another one of his issues. He told Mom that he felt Valentino wasn't adoptable. He even spoke of a family who wanted to adopt him, but chose to go with another cat when his health issues were disclosed. Mom understood the situation and knew that Dr. Pickett felt that euthanizing him was the most humane option. Mom looked at Valentino's eyes and could see how sick they looked. He had never been the most handsome kitty; his coat always seemed dirty and he felt grimy to the touch. He was a lover though and she couldn't resist petting him, no matter what his fur felt like. She agreed with the vet that Valentino didn't have a good quality of life; always sick and feeling poorly. Dr. Pickett said he would perform the procedure the next afternoon and Mom agreed to go in to be with Valentino as he made his way to the Rainbow Bridge. Mom was miserable all Wednesday evening. She knew it was the right thing, but her heart still ached. She called her friend who volunteered at the shelter and also found Valentino to be a special kitty, @Ryker_Tyker and @Allie_Kitti's mom. She was out of town, but Mom felt she should know since the vet had wanted to speak to her as well. They discussed the situation and both tried to hold back the tears that continued anyway. 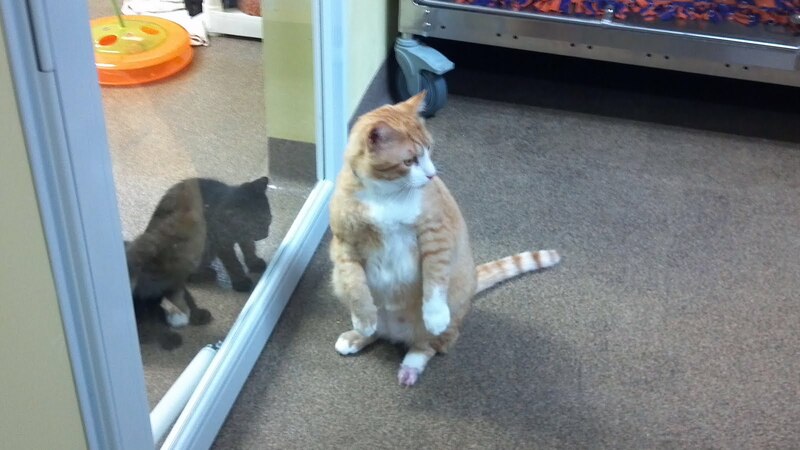 Their shared love for this shelter kitty was obvious and the sadness was very real. They both knew how hard the next day was going to be. Tomorrow I will continue the story of Valentino's Journey to the Rainbow Bridge with a recounting of Thursday's events.